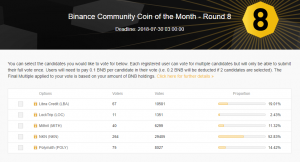 Today, on July 25 at 4:00 AM (UTC) a crypto exchange Binance has started round 8 of “Community Coin of the Month”. Voting will last till July 30 0:00 AM (UTC). At press time one coin is in the lead: NKN (NKN) with 29 405 votes (52.83%). Libra Credit (LBA) is on the second place with 10 581 votes (19.01%). The winner of round 7 of “Community Coin of the Month” was Pundi X (NPXS). 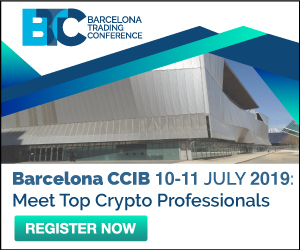 Upon completion of the voting process, Binance will list the coin on the exchange within a reasonable time frame.